Served fresh or fried, lots of wild mushrooms go from forest to the table—but know which ones are safe when harvesting this summertime delicacy. "There are 10 to 20 deadly mushroom species in Alberta, so don't start picking them for eating until you know for sure which ones are safe," said ecologist Michael Schulz, who leads spring, summer and fall fungi workshops at the University of Alberta Botanic Garden. "There's a tendency for the average person to use colour or shape to figure out whether a mushroom is edible or not, but those are the two most variable factors," Schulz warned. "Colour varies and can fade with time, and size and shape will be in a certain range, but not one of the first things you should use as identifiers." Big and small, mushrooms pop up "anywhere you've got soil, wood or plants growing," he said, including on lawns and pastures, in forests and bogs, even in planters. On the prairies, almost 2,000 large species have been identified, with countless more still unknown. Schulz has sampled more than 80 edible species from Alberta alone. Although the idea of eating fungus has a certain yuck factor—after all, fungi are the culprits behind infections like athlete's foot and plant diseases like powdery mildew and canola blackleg—there are nutritional pluses, too. Various kinds offer health benefits like protein and antioxidants. "You'd never be able to take a piece of wood and get the beneficial plant compounds out of it, but you can take a mushroom from that piece of wood and get the chemicals out by making a tea or cooking them in a stew," Schulz said. Mushrooms fall into three categories—edible, poisonous and inedible. 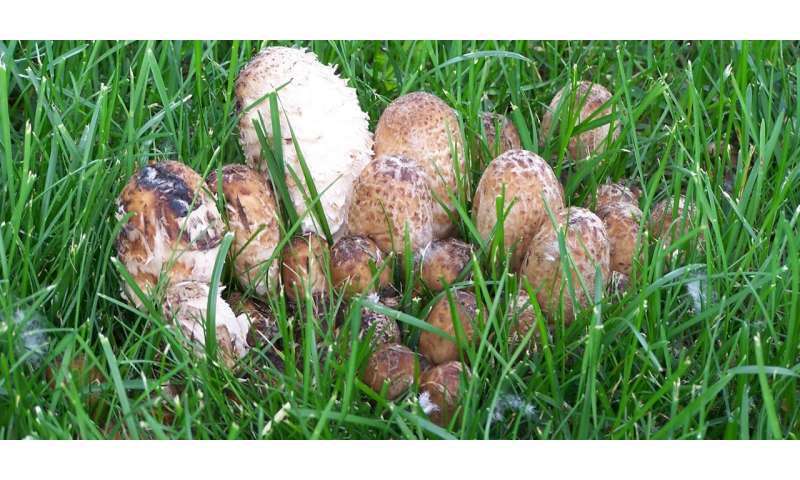 Fungi generally known to be edible include puffball mushrooms, some (but not all) types found in lawn fairy rings, button mushrooms, portobellos and creminis—a round-capped variety that has wild cousins in Alberta, Schulz noted. Safe-to-eat fungi offer different flavours from mild to earthy and are best cooked in stews, casseroles or the frying pan. "Many do a great job soaking up whatever flavours are added to the dish." Inedible mushrooms won't cause illness but are still unappetizing with their leathery, tough textures or unpleasant peppery or bland taste. "It would be like eating wood or a leaf," noted Schulz. Some, like the crusty Chaga mushroom found growing on birch trees, can be made into tea and herbal extracts. Poisonous fungi contain toxins to protect against hungry wildlife. Commonly mistaken as edible is the Amanita, a large, showy, often wart-capped group of mushrooms ranging in colour from pure white to dark brown. In Alberta, the Fly agaric, a yellowy-orange member of the Amanita family, can be found during the fall. "People will eat Amanitas because they don't taste bad and they look edible; but even if they taste good, or you see insects eating them, it doesn't mean the mushroom is safe to eat," said Schulz. "Don't go on instinct," Schulz warns. "Don't eat anything you're not absolutely positive about. There's no universal rule for telling a poisonous mushroom from an edible one, because there's so much diversity out there." Get to know just one or two edible species at a time and look for them only. "For instance, I'll learn about morel mushrooms and all the lookalikes, so I can pick them safely. Then I'll start adding to my repertoire. Otherwise it becomes overwhelming." After choosing your mushrooms, find a knowledgeable expert. "Try to spend time with people who know what they're doing before you start picking for the table." Schulz suggests connecting with groups like the Alberta Mycological Society. An expert can help you get to know the physical attributes like odour, shape, colour and other characteristics important in correct identification.